If you are heading back to work after the birth of a child and feel overwhelmed with your choices in childcare, you are not alone! Choosing a caregiver to trust with your child’s daily care and education is one of the most important decisions you will ever make, and the sheer variety of options can be dizzying, never mind all the conflicting advice. So what can you do to ensure that you have made the best childcare choice for your family? Know your childcare options and the benefits and challenges to each. You may have heard stories from seasoned parents about how their daycare became not only a safe haven for their child, but also a learning community for their entire family. Or how their nanny kept their entire family organized and thriving during the early childhood years. Or how their affordable and flexible au pair made the after school pick-ups manageable. But for every great story, you will also hear stories from parents who struggled with their childcare providers and had negative experiences with their daycare’s high teacher turnover rate, their nanny’s inability to make it to work as scheduled or the adjustment to having a young au pair living in their home 24/7. It is important to know that there are plenty of quality options for daycares, nannies and au pairs, but childcare is not “one size fits all.” So while it is wise to seek advice and ask for referrals from experienced parents, remember that every family has a different schedule, budget, family stressors, home culture, child-rearing philosophy and personality. It is critical for each family to weigh the pros and cons of each option based on their particular needs and to carefully screen their childcare choice to ensure it matches their specific standards. Click HERE to download a free comparison chart of some of the benefits and challenges of daycares and nannies to help you decide which is the best fit for your family. 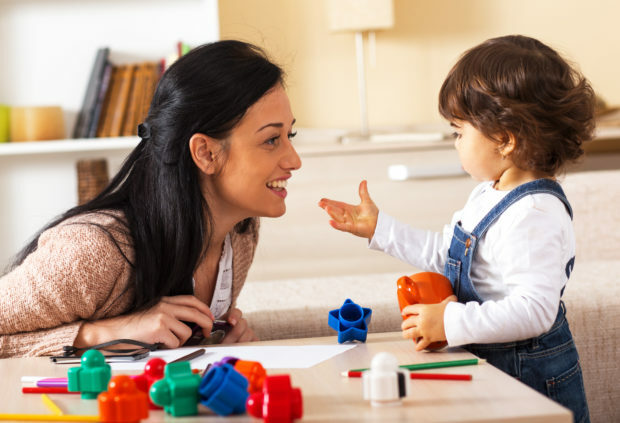 Regularly communicate and review your expectations with your childcare provider. One of the most important steps you will ever take as you enter a childcare relationship is to clearly discuss and write out your expectations in detail. If you choose a daycare, most states require the center to provide you with information on the center’s policies and procedures for topics such as: staff hiring requirements, ratio of students to teachers in the classroom, illness policy for staff and children, holidays and vacation schedules, feeding, diapering/potty, safe sleeping, outdoor play, discipline, injury, emergencies, late pick-up, allergies, vaccine requirements, curriculum and education, sanitation, etc. Be sure to read through and understand this information and what this will mean for your child, not just at their current stage of development, but also as they grow and move to the next classroom. In addition to the policies of the daycare center, ask questions about how your child’s classroom operates. Request time to speak with the teachers in the classroom about your child’s personality and schedule, along with your parenting style, and your fears and hopes about daycare. Unlike a daycare, when you hire a home employee (such as a nanny or an au pair), you become the caregiver’s employer. Because of the intimacy of this relationship, professional boundaries often become blurred and can be hard for many parents to manage. It is wise to write out your employment benefits and policies, household preferences, and childcare expectations at the time of hire, so that both parties understand what is required. Writing everything out will ensure that conflict is either avoided, or when conflict does arise, you can quickly turn to the documented agreement and calmly discuss any confusion. Consider creating a nanny contract to include topics such as: hourly/ weekly pay; required schedule and the level of flexibility required; overtime rate of pay; how taxes will be handled; what vacation, sick days, and holidays will be paid to the nanny; how the nanny will be compensated for days the family does not need care; lateness; your rules for nanny’s use of social media, TV, music, and phone; meals while on duty; dress code; outdoor perimeters; basic care instructions for feeding, sleeping, diapering, discipline and bathing; public transportation preferences; play dates; nanny cameras; cleanliness in the home, household chores and errands; vaccines required for the position; areas “off limits” in the home; and anything else that is important to you! It is so much easier to discuss these topics within the first 1-2 weeks of hire, rather than waiting until issues come up many months down the road. Evaluate and review your decision. After you have carefully screened, hired and trained your daycare, nanny, or au pair – work at building trust! Trust is something that should not automatically be given, but instead come gradually after time, consistent good behavior, reliability and the strengthening of the relationship. I am a big advocate of web cameras in daycares and homes where the caregiver has been made aware of the device from the very start. However, in my experience, cameras are best used not for the sole purpose of catching “bad” or abusive behavior, but rather to ensure that your child is in the best situation for their needs. Cameras can also be helpful to assure yourself as a parent that you are actively involved in your child’s safety, care and education. With a camera, you will be able to: watch for activities and play geared toward your child’s current developmental stage; observe your child’s tantrum and see your caregiver’s response; see your child trip and get hurt, knowing that the caregiver could have done nothing to prevent it; watch your child’s joy when her caregiver plays peak-a-boo or snuggles her at story time; and see your caregiver’s level of enjoyment in the day-to-day activities of the job. To ensure your relationship stays healthy, consider creating monthly or quarterly review times to discuss how “the job” is going, any upcoming schedule changes, the child’s current and upcoming development, and any changes that need to be made to the child’s daily routine. It is also a great time to reevaluate if this particular childcare situation is in the best interest of the child and the needs of family, and if the caregiver is happy. Sometimes parents love daycare, but their child is really struggling with the over stimulation, illness, or group care at a particular developmental stage. Or, perhaps the family loves the nanny, but the child is ready for a preschool environment, needs someone more physically equipped to chase them at the park, or the family needs someone that can help parents with dinner and housekeeping, so they can spend more quality time with the child in the evening. While families love the idea of a caregiver or center that will stay in their lives long-term, remember that so much changes in the life and development of an infant, toddler, and preschool-aged child in a six-month to one-year period of time. If the caregiver you first choose is not everything you hoped for or becomes unsuited for your child as they grow older, know that there are many other great options available and don’t be afraid to revaluate to find the best fit for your ever-changing family.